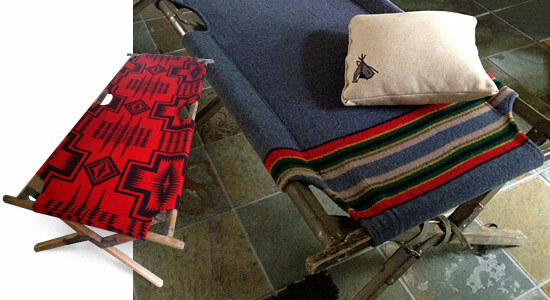 Pendleton first started weaving trade blankets for Native Americans in 1895. When a guy is building out his home, there are a lot of basics involved. A straightforward couch, a TV and then maybe something to set that TV on. Little by little, he'll fill it with things that match his taste and personality—items that are stylish, masculine and functional. These pieces from Etsy shop Indian vs Indian are all three. The Portland-based workshop rebuilds vintage military cots and retrofits them with Pendleton's Native American and camp blankets. The resulting effect looks like something from the ACE Hotel by way of Ralph Lauren's RRL ranch. But they don't just look cool. The blankets are reinforced with thick canvas, which means you can actually use them. As a coffee table, with a tray stacked with books and a candle. As a bench, at the end of your bed. They've even got some stools that would look sharp as a side table next to your favorite chair. Investment pieces? Yes. But it's also versatile, one-of-a-kind furniture that's sure to make an impact on your place.